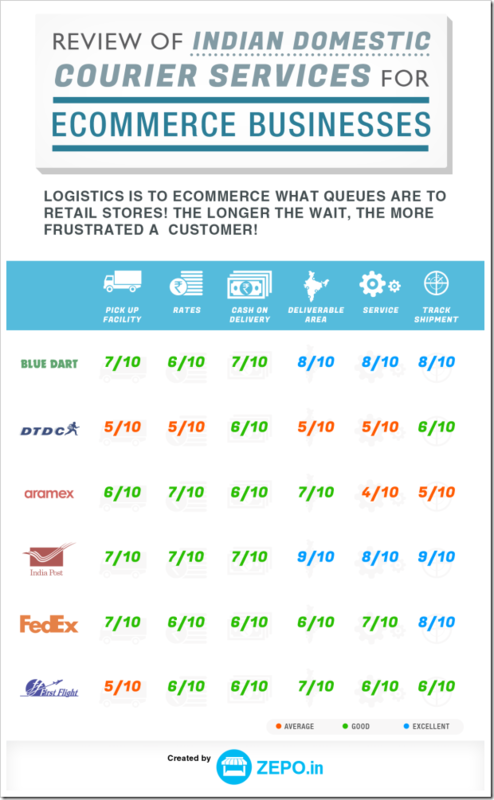 Logistics is to e-commerce what queues are to retail stores! The longer the wait, the more frustrated a customer! And that is why it is absolutely essential to choose the best and most reliable logistics partner for your business. It makes for some major disappointment when you get a call from a customer complaining about the state and time of deliveries made. Here is an Infographic created by folks at Zepo to visually present the comparative ratings. A fairly recent addition to the ecommerce logistics scene is DTDC’s DotZot. 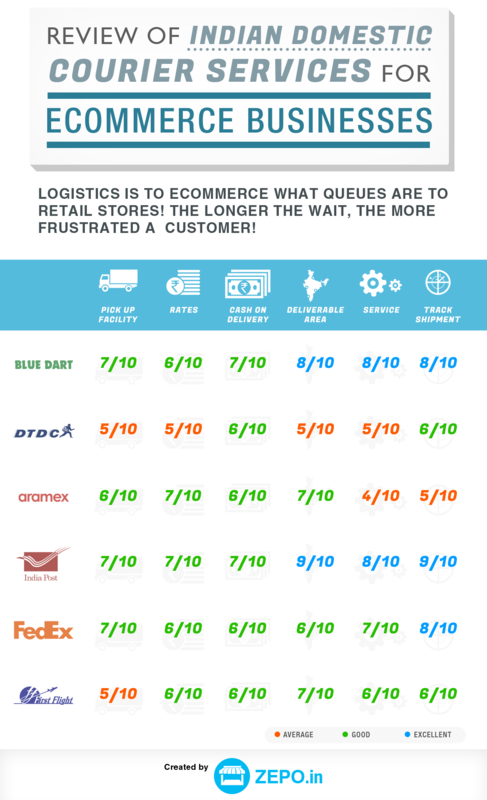 An e-commerce-only logistics solution, DotZot looks rather promising. Servicing over 8000 pin codes and 2300 cities/towns, as of now they seem well worth the shot. But it remains to be seen whether they will genuinely solve problem of small sellers or end-up being just another run-of-the-mill courier company. Indian Mobile Subscribers fall by 2.1 mln to 862.62 mln in Jan 2013! Amazon Logistics Arm Will Soon Deliver Flipkart, Paytm Orders Too! Mr. Arun Prabhudesai thanks for creating a platform , where all the latest updates are at your finger tips for the e-com segment. I was uploading my CV for a job in the courier services segment meant for e-com and i came across your site . Real Wonderful piece of information and updates . I will be following this site regularly for updates. Definitely do not go for DTDC courier. I would recommend DHL or BLIE DART. The so called Blue Service of DTDC is an eyewash. They take 8 days to deliver a simple document instead of assured 72 hrs. Never go by the convincing words of such courier companies coming out with some service gimmicks like GREEN or BLUE. I appreciate such concept of level of service but then it all depends on the quality of manpower. Always use such courier companies who has dedicated pool of talents. I cam across AGARWAL packers and movers who has really talented people and guarantee you the service they render. Further response of the service provider is very important when your customers need updates. Hi all our company is coming up with an E-commerce portal. we are based from Hyderabad our product value is very low price range value like Rs.55 to 1000. We are in search of logistics service which give us the best price in AP and Telagana with COD services and if necessary reverse pick-up from customer. Kindly Suggest me suitable Courier Services who could provide this COD service & reverse pickup. DTDC is a fraud and u have to be extremely cautious with what u hand over to them. U can never be sure whether it will reach destination. I booked an envelope containing a cheque on 14 July with dtdc at jammu for being sent to Delhi , parliament street. The tracker since 15th July , that is for last four days displays ” out for delivery”. Enquiry with the recipient revealed that they r yet to receive it. The delay has already caused a significant financial loss to me as I have to pay interest on delay in payment I had sent by cheque. I have made dozens of calls and sent my person four times to DTDC jammu agent. Phone calls r not answered and the feedback about my query on tracking site does not evoke any response. The jammu agent is evasive and rude in replies. The courier on tracking site claims they will give feedback by SMS or email if we place a request about the whereabouts of couriered article. Don’t get fooled by it , as they never reply. There needs to a courier regulator to prevent loot by such companies. Till then my request to my citizens is , don’t book by DTDC. I have been using DTDC for a while, been to several branches in Mumbai as well in Raigad, and they seem to be responsive, well behaved and do complete what has been promised. Never had issues with them. Maybe like Arun said, depends on area but well maybe my luck? And true said that they can be found everywhere. I’ve tried BlueDart but they have attitude issues, rates are high and tracking system is a fail. Given the opportunity I will totally remove the DTDC and professional couriers services from India. Before you say they are good, do some research. It does not mean if you have good experience they are good. They are good only in few areas. But, rest of India they are the worst. Cheaters. Only reason they are doing business in India even after stealing parcels or part of items from parcels, is because of worst LAW system in India. Here is it hell for honest people and paradise for fraudulent people. Even though they are charging too much for parcels, even for parcel less than 1 kg they are charging tooo tooo much. In that money you can actually travel to that location by train or bus. And Bluedart is having good service but, if you go as individual to send camera or any electronic item, they will also you Rs.2000 or more just to send the parcel from one city to other city. They are Shameless and non sense fellows. Before you ask for any price you should understand it. Also octroi taxes in few states is illegal and their courier companies ask senders to pay it. Already paying multiple taxes still need taxes???? I have been using India Post for a while for my ecom startup. The only problem that I have is that VPP (COD in India Post) is that is not trackable. This becomes a little bit of a problem and we have to ask and confirm with our customers about delivery. Can anyone tell me a cheaper logistics solution in India? Try the EPP service of India Post, their COD is trackable. I believe the tracking rating for india post is exaggerated.We have a ecommerce site and we use India post for delivery and COD every time.But when it comes for tracking we loose our hope and we have call our customer to get the confirmation message. Hmm.. Naren…Thanks for the comment. As far as my personal experience goes.. I have had no issues tracking with India post… Infact, they are far better than most other providers… But, if you are saying there must be some truth… Is it true only for some sectors…or this is a regular problem you face with India POst? I agree with the ratings. I live in Chennai and might have done lots of retail transactions. Till today, only DTDC has delivered to fail. All others have promptly delivered. Recently, one consignment booked in Delhi on 26th Feb has not reached me till now. I have been contacting their corporate office daily to deliver it to my address. For five days it was in their Chennai depot. No one attempted delivery. One week back,without any intimation, they sent the consignment back to Delhi. Its very fishy considering that my pin code is shown as serviceable in their location. I asked for explanation through email. They told they will not reply at first. When I pestered them, they sent a mail telling that my area is non serviceable, they will not deliver and that I was intimated reg this previously. There was no apologies. In their tracking status, it was told that no such person in my name exists in the address mentioned and because of that they are sending it back. Believe it or not, on 20th March, I called them again asking for more explanation, I was thrashed by their customer service executive day for being a pest and I was asked to get a life and they hung up the phone. Now I am calling the sender daily asking for a refund, the sender claims that he has also not received the item back. These “ratings” seem to be rigged! bluedart has one of the worst tracking systems available! dtdc on the other hand seem to have been given very unfair rating. I am not too sure if the ratings are rigged… Like I have mentioned in previous comments… some courier services have better network in one area while others may have good in other areas. Do not look at these ratings from topical perspective.. Look at it from India-level perspective. Having said that, I should also mention that these ratings are done by Zepo.in and are probably based on their experiences.. I dont know about e-commerce issues and I dont know about other courier services, but I know DTDC very well. In Andhra, they are in every nook and corner. When I send an envelop, they deliver it the next day with out fail. Those guys seems to know the APSRTC route timings. Based on the timings they promise the delivery time and they do it in good time. Only problem is they dont sell envelops. We have to buy it in the street and seal it. They should have their own envelops like DHL has for every size. But looking at the ratings where they are in the bottom of ratings, I think I have to try others too. But the problem is you dont find them every where. I agree with Altaf! In fact I was surprised to see DTDC receive low ratings. Even in Karnataka DTDC can be found found in small towns where biggies like FedEx, Aramex, Blue Dart are totally absent. Tracking of shipment is best with India Post according to me. DTDC status never updates properly for me.